Ask anyone who spends time in the ocean, and they’re likely to attest to the curative power of the ocean with anecdotal evidence. Salt water is good for healing cuts and scrapes, swimming helps clear out stuffy noses and other symptoms of the common cold. Ocean activities are invigorating and healthful. Vitamin D is good for you (with proper protection from the sun’s harmful rays, of course). You just feel better after a surf or a swim. “Everyone knows that,” Hawaii’s ocean enthusiasts will say. Not everyone is physically able to get out there on their own, however, and nonprofit organizations like AccesSurf are actively engaged in providing ocean experiences to children and adults with physical and/or cognitive disabilities that would otherwise keep them from the warm embrace of the sun and the sea. AccesSurf is free for everyone, visitors and residents alike. Visiting families are often among the beaming participants and volunteers at the organization’s regular events. Using specialized watercraft like surfboards, paddle boards, wave skis, and other gear (they have a water-bike, too), AccesSurf conducts its monthly Day at the Beach program at various, gentle locations on Oahu, including Waikiki Beach and White Sands Beach at Barbers Point. Each month, AccesSurf averages more than 100 participants at its events and provides over 2,000 ocean experiences each year. AccesSurf welcomes dozens of participants and volunteers to each monthly surfing event. In addition to Day at the Beach, AccesSurf also holds a monthly Wounded Warrior program (it’s not affiliated with the national organization of the same name). Launched in 2011, the program is open to all wounded military personnel. The ocean offers many proven physical and psychological benefits, not least of which is a shower of beaming smiles. The United States Marine Corps has even incorporated “ocean therapy” into its post-traumatic stress disorder treatment regime. The evidence that the ocean heals is real. Those happy smiles are proof enough of how AccesSurf changes lives forever. Participants with disabilities at AccesSurf receive the lifetime gift of hope and inspiration, and the knowledge that they have the strength to meet any challenge. The AccesSurf stories they and their families tell are filled with wonder, gratitude, and determination. AccesSurf is itself a family, or ‘ohana, and volunteers and participants are instantly welcomed into it. The number of lives AccesSurf has changed for the better is huge when you consider that there is only one full-time staffer in the organization. There is, however, a database of over 2,000 volunteers and 15 dedicated (and unpaid) Board of Directors members. The work AccesSurf does is clearly as inspirational for volunteers as the experience is for participants. Actually, it’s hard to call it “work” when everyone involved is smiling and laughing and doing something they love. 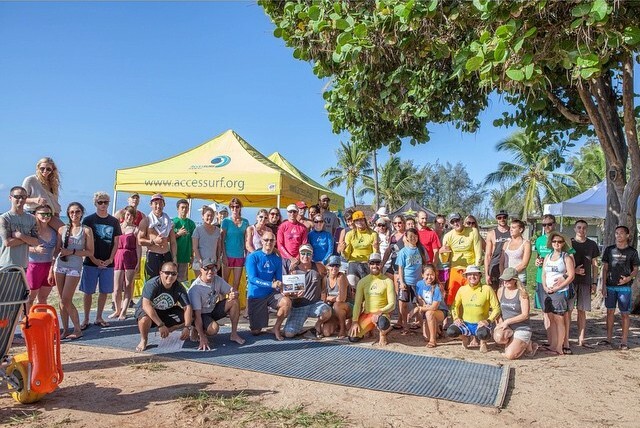 AccesSurf celebrates the dedication of its surfing volunteers. AccesSurf will hold a fundraiser on Saturday, June 13 at the Hawaiian South Shore surf shop and boutique at 320 Ward Avenue in Honolulu. It will feature a concert by national reggae music sensation and Hawaii boy Mike Love, as well as food trucks and a beer garden. Visit the AccesSurf website to participate, volunteer, or learn more about upcoming events.